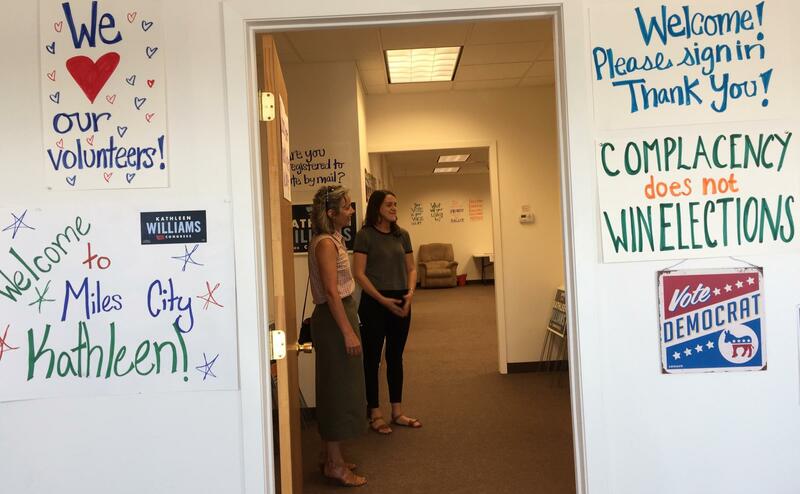 Kathleen Williams stopped by the Democratic Party's campaign office in Miles City. "Should we get started you guys?" 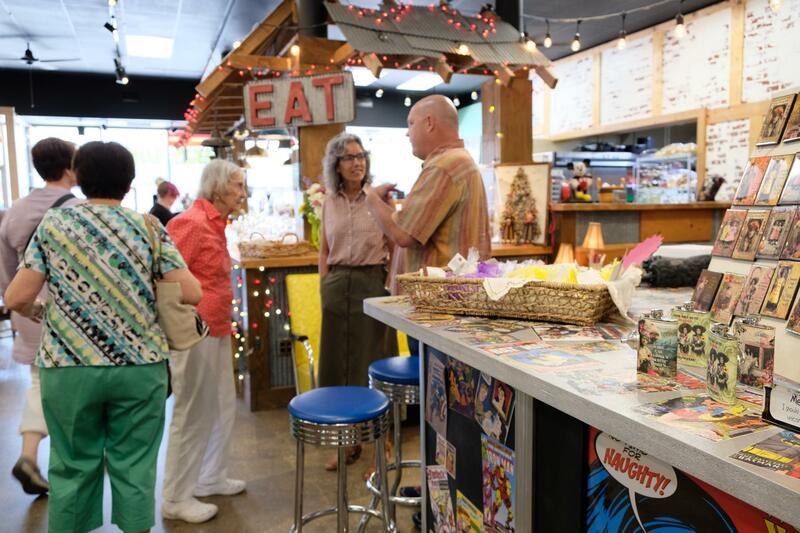 Kathleen Williams is standing near the lunch counter at what was once the Woolworth’s, then the Ben Franklin’s, and is now Vintage and Rustics in Montana, a business sells antiques, jewelry, and food. Williams says there's a vintange movement, "and I asked her (the woman who runs the bakery) if people come here, come to Miles City because of this place and she said, ‘yeah.’"
U.S. House candidate Kathleen Williams meets with some of her supporters at Vintage and Rustic in downtown Miles City. Williams told her supporters she’s impressed at how this business is helping revitalize the Miles City downtown. Williams wanted to know more and came back to Miles City primary to listen. "So on every visit across Montana I’m looking to learn from people what their hopes, struggles and dreams are, things I can work on in Congress," she told supporters during a lunch gathering. During last week’s swing across Eastern Montana, her campaign made stops in Colstrip, Miles City, Glendive and Ekalaka. The former three term legislator from Bozeman says the fact that this area tends to run conservative and often votes Republican does not deter her or her campaign. "I have always considered myself a very independent thinker and voter," she said. "In fact, I always thought I was an independent and even thought about running - both for this race and the legislative race - as an independent, but I don’t think our system is quite ready for that." Williams also downplays her gender on the campaign trail. "I got asked that a lot during the primary," she said. "People would express, ‘I can’t wait to vote for a woman.’ And I would say, ‘well, isn’t it great that the most qualified candidate just happens to be a woman.’"
On the stump, Williams talked about being a hunter, her work with the agricultural community on range management and water conservation, and about reaching across the aisle at the Montana Legislature to get bills passed. She doesn’t talk much about her opponent, political party affiliation or gender. That appealed to some of the supporters who had lunch with her. 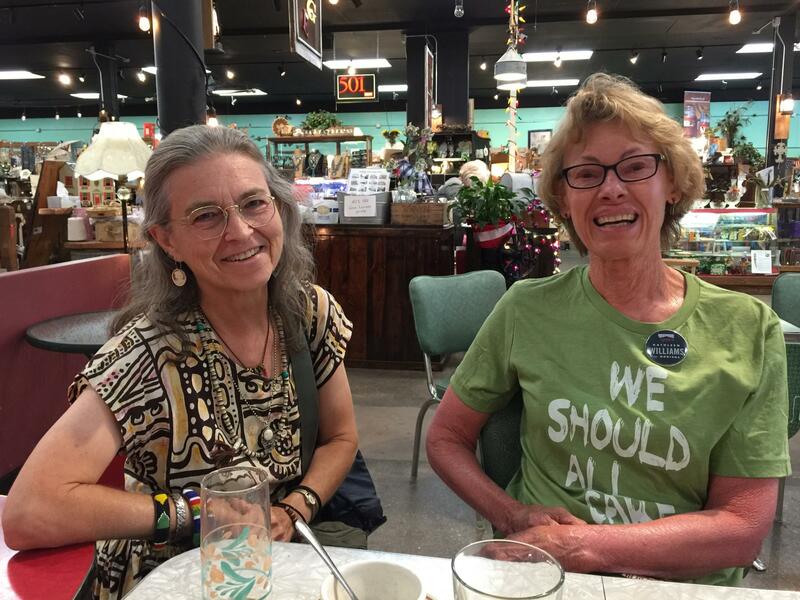 Marie Root and Barb Cole, from left to right, were among the Democrats in Custer County who had lunch with Kathleen Williams at Vintage and Rustic in Miles City. "I don’t think it necessarily matters," said Barb Cole who has lived in Miles City for the past 42 years. She says Williams is strong on the issues, and she pointed to a Democratic U.S. House candidate forum held before the June primary. "And after that forum I went up and I said to her, 'you have my support,'" Cole said. She said that's even among the 5 candidates she was also impressed by 2 of the men. "It was how she presented, how she just connected," said Cole. "But in addition to that, I do think we need many, many more women in Congress." "They need to be the right women," said Marie Root, who's originally from Miles City but now lives in Missoula. "Yah, not just any woman," replied Cole. "No. it’s just the same as every man is not a good candidate." Both women say while the number of Democrats may be small in Custer County, they are becoming more active. The Montana Secretary of State's website said with nearly 42% of registered voters casting ballots during the June 2018 primary, 1,726 ballots were cast for Republican incumbent Greg Gianforte. That figure was below the total number of Republican ballots cast in the U.S. Senate race. Among those who chose the Democratic ballot, 377 voted for Democrat John Heenan and Williams was second with 222 votes. Total Democrat ballots cast in the U.S. House race in Custer County was 810; total Democrat ballots cast for incumbent Senator Jon Tester was 844 in Custer County. Executive Director of the Miles City Area Chamber of Commerce John Laney visits with Kathleen Williams and her campaign staffer. 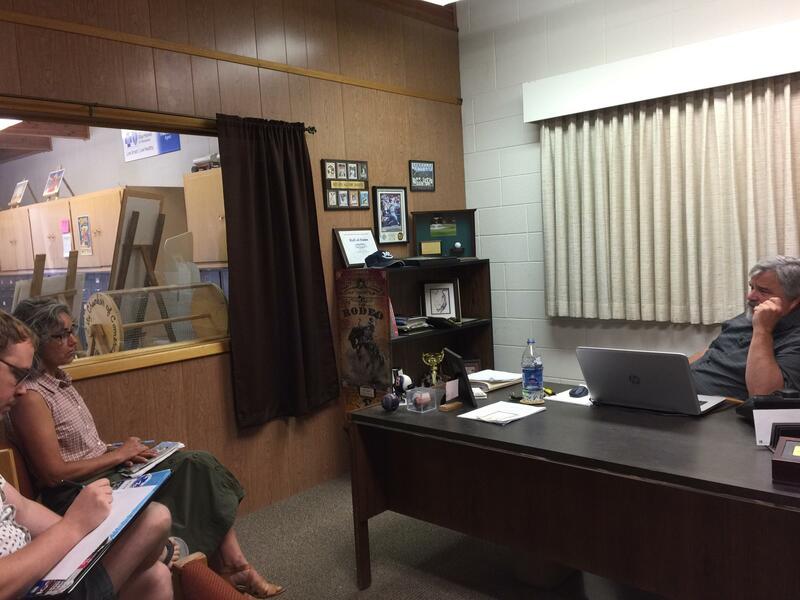 John Laney, the executive director of the Miles City Area Chamber of Commerce, said he has no “magic formula” for a candidate who comes calling to seek advice on what it will take to win in Eastern Montana. "It’s a real easy answer, I have no idea who’s going to win," Laney said. "Nor from the job standpoint I don’t care." That's because the Miles City Chamber doesn’t endorse candidates. "So red, blue, green, purple, I don’t care," he said. "I just want them to understand our needs and hopefully persuade them to be a little bit cognizant of them and maybe a little bit passionate about them." Laney met with Williams for about an hour in his office. They talked about front line issues in the community, including the impact of redrawn floodplain maps that put most of the town in the floodway, the role of agriculture, and the uncertainties the community faces. 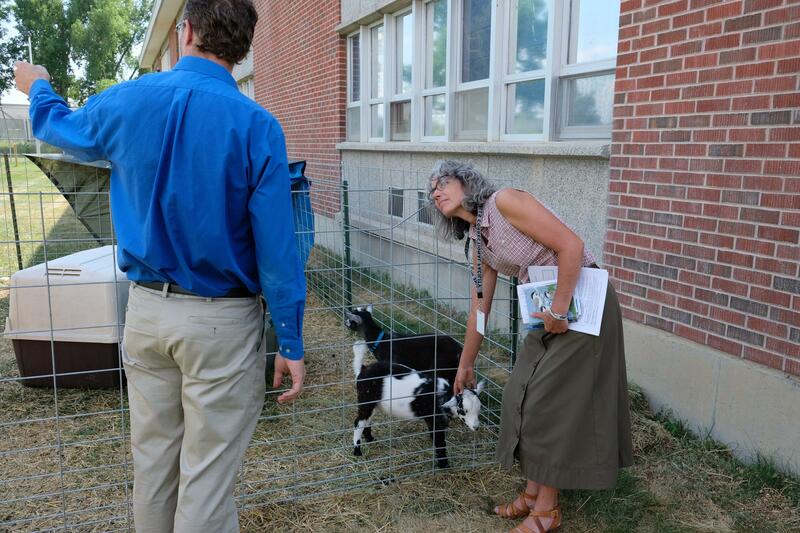 Kathleen Williams pets one of the pygmy goats at the Pine Hills Youth Correctional Facility. Williams also toured the Pine Hills Youth Correctional Facility with Superintendent Steve Ray. They toured the campus and looked at the residential block, school, crops and farm animals raised by male teens who were sentenced to the facility. Three candidates are vying for Montana’s lone U.S. House seat, besides Democrat Kathleen Williams and Republican incumbent Greg Gianforte, there’s Libertarian Elinor Swanson.